1. You are comfortable performing surface-mount soldering with *tiny* components. 2. You’re able to commit to sharing the results of your build within a month of me sending you a unit. 3. You have at least one existing plant on which you will use your new growerbot. The new units are going to be solar-powered, with wifi and eventually BLE connectivity. And, get ready to control your irrigation system too! This entry was posted in Uncategorized on May 24, 2014 by luke iseman. Hi Luke, I’m interested, I already have a Growerbot and testing the new one could be nice. Soldering surface mount component by hand is difficult but doable, how many tiny component are you talking about? ~30 components. You can also opt to wait a month and I can give you a populated board to try, if you’d prefer! I see arround 20 on the picture, is there some on the back? Because it looks like ok like that. 30 il take some time but if it can help you I’ll do it. Alexandre: your beta kit is on its way! Please let me know how the build goes! Thanks, I will comment for sure! Hey! I’d love to try it out! But I live in Sweden… Would it be possible to ship it here? And how long would that take? Hi Simone, it should take 2-3 weeks to get to you. email me your snailmail address and i’ll send one! I have more than a decade of gardening experience. I have over two dozen plants I can try the equipment on. I have not purchased the hardware. I’m willing to build the device and share detailed results. Jeffrey: email me your snailmail address, and I’ll get one in the mail! Brad: email me your shipping address and I’ll get one out to you! Didn’t see any other place to put this, sorry. The link to your “documentation on garduino” fails…. I am getting started on the Arduino-based wifi automation for a 150′ long commercial greenhouse with nine 50′ beds, that is heat pump heated, heated rootzone, heated-water-irrigated. Each bed has separate controls for irrigation, water temperature and night-time air temperature. Greenhouse is rolling nicely now, producing literally tons of food using heat pumps hacked from craigslist window-mount air conditioners. Cold storage box has not been delivered yet – hooking it up will my late summer project. So it is now time for me to build the automation. I am fascinated to see if/where/how I can utilize stuff you have already developed. As I noted on the Kirsten Dirksen video – I think the core idea of social gardening – that we need to know what conditions the plants we depend on want and need, and obviously we do not know yet – is crucial. This sounds awesome, Joe! Let me know if you’re comfortable doing smt, and I’ll send you a beta v 1.5 kit! First round of data is in – by giving the plants close to what they want (cool leaves, warm roots) we have increased crop yields (cukes and tomatoes) by 2X to 3X (per plant or per square foot) compared to the controls (same plants planted same day) growing in 8 other greenhouses on the site. If you have one for me, I`ll be glad to test it. I’ll get one in the mail to you end of next week. Same address as I sent the kit to, right? Hi, Here in Vermont I’m putting up a 10×16 polyvinyl greenhouse to extend the season and would be interested in trying out the new growerbot. I’ve done soldering and programming so would be willing to be a beta tester. Do I need to buy one of the existing kits before trying out the new material? Email me (luke@lukeiseman.com) if you’re comfortable doing surface mount soldering, and i’ll get one your way! I’m a student in Atlanta, GA. I love gardening and have experience with surface mount soldering and building Arduino projects. I’d like to be a beta tester and share my results. Hey – this looks great! I am just researching ways to automate arduino garden interactivity (I want an umbrella to open over my greens when it gets over 85, for example.). I graduated from the university of Illinois extension’s master gardener program and I run the gardening blog jackassgardener.com – a blog whose whole mission is to make gardening entertaining and would be a great place for this. I’m a professional writer, performer and teacher. Anyway great work! Pregnantbuffalo at gmail dot com! Let me know if you need more testers – my brother in law is a gardener and also builds arduino projects all the time. I’m really interested in your projects. A group of my friends were planning a scaffolded garden bed when we came across your page. We are a group of students from Charleston, SC with background in medicine, environmental science, plant biology, and computer science. 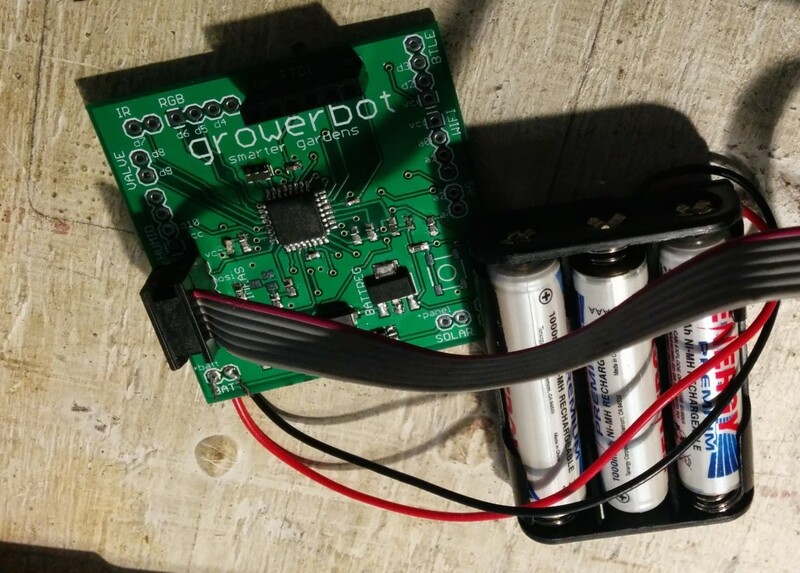 Your Growerbot looks exactly like what we are looking for to make gardening into what are trying to do. We are capable of sms and even have access to cool tools, like 3d printers. Please let me know if there are any available positions for testing, we would love to use your product. I am wanting to develop a product to manage large grow cells for WA State I-502 grow ops I will be working with in Grays Harbor County. I am an IT Consultant by profession, but have been drawn into this project by a long time customer that has a producer/processor license. I have been up all night this evening working or Pro-Forma number to get financing and would like to work with the growbot project to develop something that will be able to scale up for a commercial application. I have been looking at Arduino boards in particular the new YUN board with Wi-Fi. I have also been programming since I was 15 and am now 55 years old. This is going to be a fun project aand it look like you have done a ton of work already. Count me in for any testing or prototyping. Sounds great, Tom! Let me know what I can do to help your planning / when you’re ready for a sample unit.